This is a ‘special’ edition within the well-established IoW series of photo essays. It broadly follows the series standards, but contains more text than usual, together with an excellent photo collection and some coloured drawings. Highly recommended. DESCRIPTION: This is a ‘special’ edition within the well-established IoW series of photo essays. It broadly follows the series standards, but contains more text than usual, together with an excellent photo collection and some coloured drawings. Highly recommended. The T-34 medium tank was ready at the perfect time for the Red Army. It benefited from the Russian experiments with Christie suspension that enabled an armoured vehicle to achieve much higher speeds cross-country and cope with a range of ground conditions. This was important for the Red Army because they would be fighting across ground which was frozen solid with rutted ice and snow, then turning into thick mud and water courses, before enjoying a brief period of dry firm conditions. 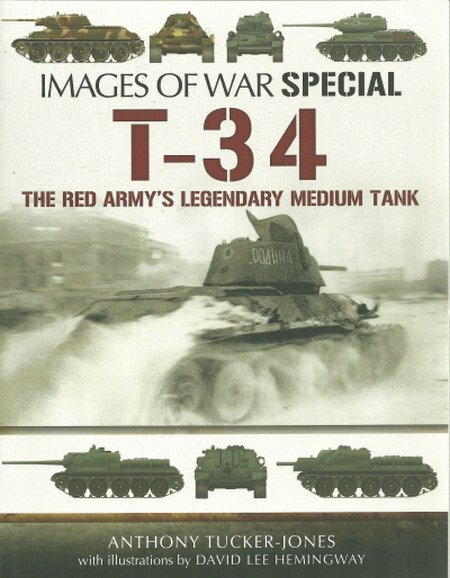 Technically, the T-34 came as close as was then possible to the ideal armoured equality between mobility, fire-power, and armoured protection. The production quality often left much to be desired, and conditions for the crew had not received the same priority as other areas of design, but the tank did prove ruggedly reliable and could be maintained with basic tools and engineering skills in the field. The German Panther was potentially a far superior AFV, and directly intended to counter the T-34, but it required high levels of maintenance with skill levels and tools to match. That meant that it was built in much smaller numbers and had reliability issues that reduced its operational reliability. The result was that T-34s attacking in far greater numbers frequently overran the Panther. The T-34 proved to be a durable design through a long life, with some reported to be operational into the 21 first Century. Over the years, the armour has been increased by bolting on additional thicknesses of steel and the firepower has been increased in calibre, barrel length, weight of shell and rate of fire. As with many other tank designs, the T-34 has been modified to produce assault tanks, bridging tanks, recovery vehicles, and engineering vehicles. It has often been claimed as the best tank of WWII and it has certainly proved a very effective design. However, there have been many other designs that have achieved great success in particular niches and the designs entering service late in WWII, and into the start of the Cold War, were later generations, having a higher build quality and much more electrical sophistication. This is a very interesting and comprehensive book and covers its subject well. The illustrations are excellent and include many rare images.